To Cite: Uslu S, Zubarioglu U, Sozeri S, Dursun M, Bulbul A, et al. Percentiles of Oxygen Saturations (SpO2) and Heart Rates (HR) in Premature Infants in the Delivery Room, Iran J Pediatr. 2017 ; 27(6):e11650. doi: 10.5812/ijp.11650. Background: The aim was to describe reference values of oxygen saturation (SpO2) and heart rate (HR) in preterm infants immediately after birth. Methods: The preterm (< 35 gestational age) infants who did not require any intervention were included in the study. The recordings were taken by pulse oximetry during the first 15 minutes of life. Results: Totally 151 infants were analyzed. At 1 minute, the median (IQR) preductal SpO2 and HR were 61% (57 - 66) and 100 (90 - 107.3) bpm, rising at 5, 10 and 15 minutes to 80% (75 - 84) and 155 (142 - 164) bpm, 90% (88 - 92) and 155 (150 - 160) bpm, 96% (94 - 98) and 155 (149 - 162) bpm respectively. Conclusions: Oxygen saturation levels of preterm infants in delivery room are lower than reported in NRP guidelines. Clinicians who use pulse oximetry in HR follow up of premature babies should know HR may be < 100 bpm in first minutes of life and should avoid unnecessary positive pressure ventilation. More than one million newborns per year need resuscitation all over the world and the majority of them are preterm infants (1). Published neonatal resuscitation algorithms suggested that oxygen supplementation should be guided according to oxygen saturation monitoring. These algorithms have suggested that pulse oximeter should be used during resuscitation of preterm infants to avoid potentially harmful hyperoxia and also hypoxia. Targeted pulse oxygen saturation (SpO2) levels were determined in neonatal resuscitation program (NRP) for only term neonates (2-5). However data on changes in SpO2 in preterm infants are very limited and are not included in NRP. Heart rate (HR) measurement is used to evaluate the need for and response to resuscitation at birth. If the heart rate is persistently less than 100/min, assisted ventilation should be commenced. On the other hand, increasing HR is a basic marker of effective resuscitation, and HR > 100 bpm is the expected normal (2-5). Heart rate is usually detected by auscultation immediately after birth. Electrocardiogram (ECG), an established and accurate method of monitoring HR, is rarely used in the delivery room for a number of reasons (6). However, it is possible to measure the HR with pulse oximetry which is increasingly used during neonatal resuscitation (4-7). The aim of this study was to determine SpO2 and HR trends and to establish the reference values and nomogram in premature infants immediately after birth, measured by pulse oximetry. The observational prospective study was performed with preterm infants (< 35 gestational age) who did not require oxygen supplementation at the delivery room in Sisli Hamidiye Etfal Education and Research Hospital between November 1, 2013 and May 1, 2015. The study protocol was approved by the ethical committee and written informed consents were obtained from the parents. Exclusion criteria included preterms requiring oxygen, ventilation, medications and interventions [including continuous positive airway pressure (CPAP), positive pressure ventilation (PPV) or intubation] at birth, with congenital abnormalities, poor biophysical profiles, or insufficient records. Delivery room procedures following a premature birth were as follows. All newly born premature infants were assessed at birth. A pediatrician and two neonatal nurses attended each delivery. A separate team was present for each infant of a multiple gestation. Resuscitation protocols were performed according to the NRP guidelines by different pediatrician and neonatal nurse if necessary (8). The time of birth was determined at the time of cord clamping, which occurred immediately after birth. So the chronometer was started at clamping of the cord. The time to apply the sensor and the time of first reliable reading of SpO2 level and HR were noted. The oximeter was set to acquire data with maximum sensitivity and sensor off. Oxygen saturation levels and HR were recorded and downloaded automatically every 2 seconds to a computer. The averages of SpO2 levels and HR, 30 seconds before and after each minute were accepted as one-minute result of that interval. The measurements were analyzed with normal signal of the oximeter and good quality data (excluded data with low signal and low perfusion indices) in order to protect the artifacts that occur when pulse oximetry is used and might cause false low values during the first minutes of life. The measurements were recorded during first 15 minutes of life. Both HR beats per minute (bpm) and SpO2 (%) level measurements were performed using two new-generation pulse oximeters (Masimo radical, Masimo corporation, Irvine, CA, USA) secured with coban wrap (3M health care, St.Paul, MN, USA). Prior to the measurement, the precision was set to maximum sensitivity and alarm was muted. Sensor was placed at the right wrist (preductal) after cord clamping. Next, the probes were connected to the pulse oximeters. Gestational age assessment was defined as follows; it was calculated from the first day of the mother’s last menstrual period (LMP), if LMP was not known we used sonographic evidence of early pregnancy or the criteria of New Ballard score (9). The case report forms were used to record data to prove that all procedure was performed routinely. Statistical analyses were performed by using the MedCalc statistical software (Turkey). All results are expressed as mean ± standard deviation, median and interquartile range (IQR). MedCalc statistical software program was used for calculation of continuous variable nomogram. The percentile curves were plotted with Microsoft Excel 2010. Comparisons between subgroups were performed by using the student t test for parametric variables. P < 0.05 was considered to indicate a significant difference. During study period 319 preterm babies were born. Of these, 106 required supplemental oxygen and/or resuscitation, 7 had congenital anomalies, 55 were excluded for other reasons (insufficient records, lack of sufficient medical staff, simultaneous delivery, delayed arrival of the research team, need for respiratory support after delivery room procedure, etc.). After enrollment, a total of 151 preterm newly born were analyzed. Seventy nine (52.3%) of the infants were female and 126 (83.5%) were delivered by cesarean section. Mean gestational age was 32.9 ± 1.4 weeks and median gestational age was 33 [interquartile range (IQR): 32 - 34]. The average birthweight was 1888.8 ± 344.5 g and median value was 1910 g (IQR: 1690 - 2100). Oxygen saturation levels and HR values could be detected in 142 (94.04%) infants within the first minute of life. From the second minute, measurements were obtained from all infants. For 142 preterm infants 10th, 25th, 50th, 75th and 90th percentile of SpO2 levels at 1 minute were 54%, 57%, 61%, 66% and 71%, for 151 infants those at 5 minute were 69%, 75%, 80%, 84% and 89%, at 10 minute were 84%, 88%, 91%, 92% and 94% and at 15 minute were 92%, 94%, 96%, 98% and 100% respectively. At 1 minute after birth, for all infants, the 10th, 25th, 50th, 75th and 90th centiles of HR values were 87, 90, 100, 107, 114 bpm, 134, 142, 155, 164, 172 bpm at 5 minute, 144, 150, 155, 160, 165 bpm at 10 minute, 142, 149, 155, 163, 166 bpm at 15 minute respectively. The graphical presentation of percentiles of preductal SpO2 and HR for premature infants in first 15 minutes of life are shown in Figures 1 and 2. The 10th, 25th, 50th, 75th and 90th percentiles of SpO2 levels and HR values are presented in Tables 1 and 2. 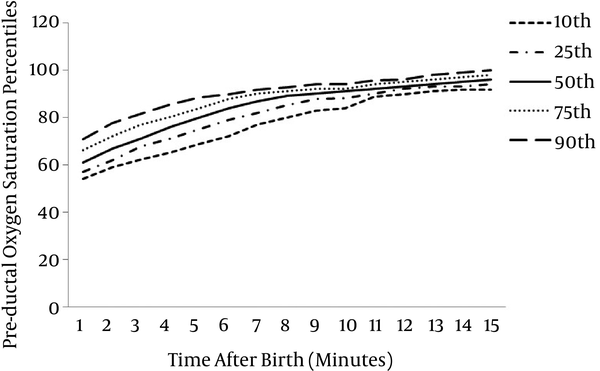 At 1 minute after birth, the median (IQR) preductal SpO2 and HR were 61% (57 - 66) and 100 (90 - 107.3) bpm, rising at 5, 10 and 15 minutes to 80% (75 - 84) and 155 (142 - 164) bpm, 90% (88 - 92) and 155 (150 - 160) bpm, 96% (94 - 98) and 155 (149 - 162) bpm respectively. Preductal median SpO2 and HR measurements during first 15 minutes are shown in Table 3. The babies who had HR < 100 bpm were 49.3% (n = 70) at 1 minute and 13.9% (n = 21) at 2 minutes. It was remarkable that the average of HR was below 100 bpm in the first minute of life (99.6 ± 11.0 bpm). In this study, SpO2 and HR changes were shown in premature babies who were not supported with oxygen and ventilation in delivery room at first minutes of life. Also SpO2 level and HR value differences in premature babies which were not included in NRP guidelines were emphasized with the help of percentiles. There are several studies focusing on saturation levels in healthy term neonates by applying new generation pulse oximeters in delivery room (10-14). In literature, preductal SpO2 levels in term babies were found higher than preterm babies as we also established in our study. Besides this data we showed that preterm babies’ SpO2 levels had a more slow increase than reported in NRP for term babies. So, approaches (oxygen supplementation) in NRP should be evaluated with slightly different SpO2 set levels (3% less than term babies in first 5 minutes of life) for preterm babies according to term ones, because unnecessary oxygen administration will cause oxidative stress that can last up to 4 weeks after birth (15). There are few reports of target SpO2 levels with preterm babies in delivery room. Nuntnarumit et al stated that the median SpO2 values (IQR) at 2, 3, 4, 5 and 6 minutes were 77% (72 to 92), 84% (75 to 94), 88% (80 to 94), 90% (79 to 95) and 95% (85 to 97), respectively (16). These results appear to be higher than our study findings. Our explanation for this situation is that it is because of the 60 seconds delay in attachment of probes due to basic steps of resuscitation. In our study SpO2 levels had similar results but slightly more narrow range and lower values than those of Dawson et al. (17). This situation may depend on determination of premature action as cesarean indication from obstetricians in our hospital, major part of cases were formed from babies born with cesarean section [83.3% vs 48%], and maternal oxygen administration with conventional approach during cesarean section. It might be expected that SpO2 levels were lower in our study because more babies were born with cesarean section. Katheria et al concluded that premature infants who receive umbilical cord milking have higher SpO2, therefore we could determine SpO2 levels to be higher to some degree (18). The target oxygen saturation levels were stated at 2015 world health organization (WHO) recommendations on interventions to improve preterm birth outcomes as follows: 55% - 75% at 2nd minute, 65% - 80% at 3rd minute, 70% - 85% at 4th minute, 75% - 90% at 5th minute and 85% - 95% at 10th minute (19). Target values of SpO2 determined by WHO for premature babies have quite a wide range according to ours and Dawson et al’s study (17). This situation may cause different applications to determine oxygen supplementation in practical approaches. Although graphical presentation of percentiles of SpO2 follow up levels of premature babies in delivery room are presented in literature, percentiles of SpO2 levels could not be found. With this aspect, the objective of the current study is to provide reference values of percentiles of SpO2 levels that pediatricians may use during resuscitation. In our study, we obtained similar graphical view to percentile charts of Dawson et al. (17). Considering all studies about follow-up SpO2 levels of premature babies, it is remarkable that fluctuation was noticed during first 5 to 7 minutes and then became more stable and rose slightly after 10 to 15 minutes. At present, pulse oximetry is used routinely to monitor HR or titrate oxygen delivery in only 30% of United Kingdom delivery units (20). However, van Vonderen JJ et al stated that ECG is the faster way to acquire HR after birth but ECG has disadvantages in premature babies like the risk of pulseless electrical activity being misinterpreted, difficulty ensuring its adhesion to the skin [blood, mucus, vernix, amniotic fluid], possible skin damage, insufficient space in premature babies, and delayed resuscitation (21-23). Therefore, specifying feasible alternative suggestions (like digital stethoscope) in a clear manner intended for developing countries will be useful (24). For these reasons using pulse oximeters in SpO2 and HR follow up of premature babies in delivery room will be suitable (in umbilical cord late clamping strategy, immediate clamping from the moment of birth with attachment of probe in a suitable way). In our study premature infants had lower HR and it rose more slowly than in term infants according to previous studies especially in the first 5 to 7 minutes of life (25). 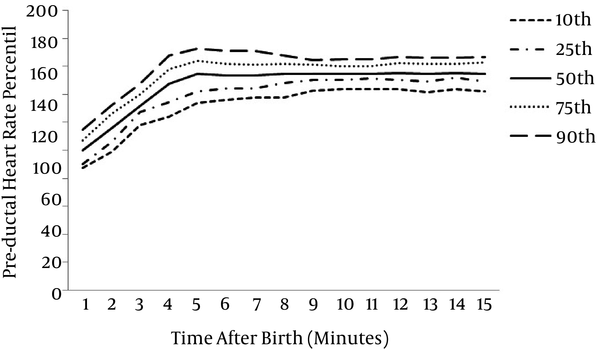 Compared to our study, Pichler et al found lower HRs and a slower rate of HR rise in premature infants (26). Pitchler et al used late cord clamping strategy in their study. It was reported that late cord clamping causes lower HR in first 10 minutes of life (27). In our study, similar to Dawson et al, HR of premature babies rose at first 5 minutes and then reached a steady speed in percentile chart. The initial assessment cornerstone in first minute of life is considered to be a HR > 100 bpm in neonatal resuscitation algorithm. On the contrary, we found that the mean HR for premature infants was < 100 bpm at 1 minute. In addition, half of babies at 1st minute and 13% of babies at 2nd minute were found to have HR < 100 bpm. Same findings were also underlined by Dawson et al. (25). Heart rate < 100 bpm at 1 minute of life is not a ventilation criterion alone and may be considered normal, it should be evaluated with respiratory effort and muscle tone and not isolated from other signs, it should not be an indication for immediate ventilation. Oxygen saturation levels of premature babies in delivery room are lower than those of term babies as stated in NRP guidelines. Clinicians who use pulse oximetry in HR follow up of premature babies in delivery room should know that HR may be < 100 bpm in first minutes of life and should avoid unnecessary positive pressure ventilation. Percentile charts obtained from our study should help clinicians determine the approach to premature babies in delivery room. The preliminary results of this survey have been presented at the 1st congress of joint European neonatal societies, September 16 - 20th, 2015 as an oral presentation.